There are plenty of gift guides floating around, but finding the best hiking gift guide just in time to create happiness in the heart of your favorite hiker? Using REI Co-op as a trusted source for these hiking gifts is a no brainer. I've been using REI gear and clothing for 4+ decades. Excellent selection of quality outdoor gear and clothing at various price points and sizes makes gift giving easy. As a co-operative, they give back a percentage (typically 10%) of your annual purchases every spring. Hint: You can reward yourself later with a little (or big) something, just by giving REI gifts! And lastly, REI demonstrates awareness of environmental and inclusion issues far beyond many other big gear companies. These reasons also explain why I'm an REI affiliate. I know they carry top brands, offer great customer service and return policies, and give back to their members via the annual dividend mentioned above. Now you know why this best hiking gift guide is built around REI's rock solid selection of outdoor gear. When you purchase hiking gifts from REI using the links in this best hiking gift guide, Hiking For Her receives a modest percentage of your purchase price, yet it costs you nothing extra. Your choice supports the efforts of this website to share trustworthy hiking tips with hikers of all backgrounds and abilities around the globe. This hiking gift guide is definitely not a collection of random hiking stuff. You've found one of the best guides to gift giving for hikers, because it is vetted by a veteran hiker who knows her way around the always changing world of hiking gear and outdoor clothing. 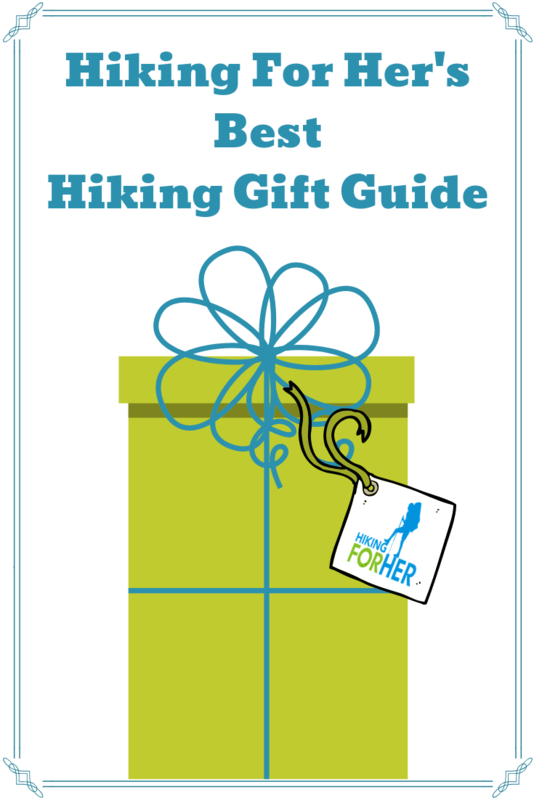 In total, 15 gift suggestions for hikers are lined up for you in this best hiking gift guide! Every one of them is something I own, have used, have gifted myself, or have added to my own current wish list. Click on each image for REI's detailed description, current price, and customer reviews. These five gifts under, or near, $20 are just right when you want something practical but thoughtful as a hiking gift. Is your favorite hiker (or trail buddy) a neat freak? If everything has a place, she'll love this Nite Ize Gear Line Organization System. It weighs 4.5 ounces, but will give her endless possibilities inside the tent for her lighting, electronics, wet clothing or gear, and more. This can also be used in a camp kitchen, or in her gear locker at home, to round up all of those little items that you need but just can't seem to put your fingers on. Staying with our organization theme, this set of 3 REI Co-op Nylon Ditty Sacks makes segregating gear inside a backpack an easy job. Looking at this cheerful line up, I see a happy yellow lunch sack, a bright red first aid and emergency supply gear sack, and a colorful green ten essentials sack. If your hiker is just getting into backpacking, this stainless steel small pot makes a great start to her outdoor kitchen, with its hinged handle and fitted lid with top handle,. Even day hikers can use this gift, as part of a survival kit for scooping up snow to melt or collecting rain water. It would fit very nicely into that red ditty sack above! Want to jazz up the gift a bit? Stash a pair of technical hiking socks or some trail treats inside! Or nestle this first aid kit within. Another approach to inexpensive gift giving for a hiker is to stay with the classics. A Buff comes to mind. This stretchy microfiber bandana, hairband, scarf, you name it is something every hiker will hunt for time and time again in her backpack. And don't worry, it isn't even possible to have too many Buffs, because they come in an assortment of eye catching colors and designs. Here's one of the most practical items in my own backpack: a Therm-a-Rest Z-Seat Pad. Great for kneeling in the snow or dirt, or additional cushioning to prevent body heat from escaping when seated on cold wet rocks. These hiking gifts are unique, thoughtful, or both. Which makes you look really good for wrapping them up for her. Sometimes your hiker wants to go as fast and light as possible on a short day hike. Help her out with this REI Co-op Trail 2 Print Waistpack. Just enough room to stash keys and snacks, comfortable enough to forget she's wearing it thanks to the breathable mesh back panel. Or is she more of a backpack type of hiker? This REI Co-op Flash 18 Pack is going to make her smile when she wants good design features like padded shoulder straps, detachable hip belt and sternum straps, hydration compatible interior, and ice axe loops for gear attachment. If your hiker is building up her inventory of backpacking items, this Cocoon CoolMax Mummy Liner can save her from the expensive of a new sleeping bag. It's designed to provide 5 degrees (Fahrenheit) of additional warmth inside a sleeping bag, yet weighs only 9 ounces. And on mild nights, it can act as a lightweight blanket on top of a sleeping bag. Now here's something you don't find in every hiker's gear: the Celestron Elements FireCel+ Portable Power Pack. Is your hiker a trail gourmet? Or interested in healthy eating? This Harmony House Backpacking Kit will allow her to mix and match her seasonings and protein sources (beans) with ease. Sometimes you want to delight your hiker with a special occasion gift to convey your sentiments without saying a word. These choices go the extra mile in that regard. Although these gifts hover around $100 or go beyond, you just never know when REI will put them on sale! And all of them are items I have used and can highly recommend as stellar hiking gifts. An all-in-one heating system makes nearly instant hot water for a warm hiking lunch (think soup, tea, coffee and hot chocolate) for day hikers and backpackers alike. Super easy to use, lightweight, and a handy survival item to pull out of the pack when needed. And that bright red ditty sack you saw above? It would fit nicely into it. Note that the fuel canister is sold separately, but can't be sent to you due to federal regulations. Your nearest REI store has an abundant supply. I can't say enough good things about hiking with trekking poles, to save knee cartilage, enhance balance, and cut down on fatigue while hiking steep trails. 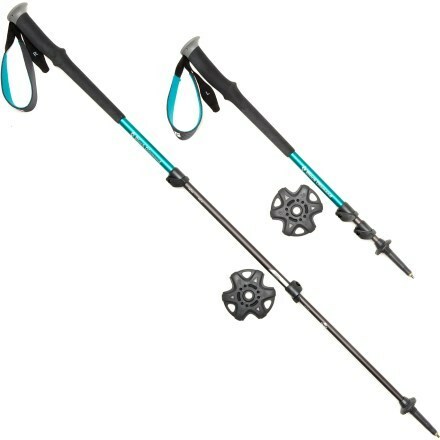 A pair of hiking poles for an older hiker, or one who is recovering from an injury or recent surgery, will be a welcome gift for years to come. If your hiker travels in bear country, she has a few options for storing her food safely. Here's the Ursack Major Bear Bag, which fits easily into her backpack and doesn't require hanging at her campsite. It's suitable for terrain where chewing rodents are a menace, too. Hikers are always looking for ways to stay drier and warmer. Adding this pair of Kahtoola LEVAgaiter GTX Gaiters to a hiking outfit is a sure fire way to guarantee debris- and mud-free boots when the trail turns yucky (that's a technical term). Easy to put on, lightweight, fast drying, and small in the pack, what a great hiking gift! Sometimes loved ones worry about a hiker when she's away doing the thing she loves (ahem!). Here's a great way to stay in communication with her: a SPOT satellite GPS messenger system. send an SOS message if the need arises. 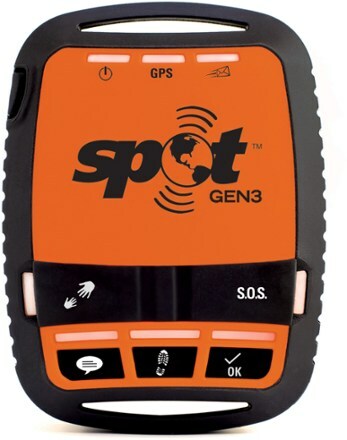 I've carried SPOTs in the backcountry on numerous hiking trips, and can state that the peace of mind the SOS button (never deployed, luckily) bought me was priceless. Note: This device requires a yearly subscription for activation. It's not cheap, but if you're at all worried about staying in touch with your solo hiker, or giving her a way out of a dicey situation, this is an ideal gift for peace of mind. A hiker needs to keep track of time and distance, and may want to monitor pacing and performance as she hits benchmarks on a hike. A Garmin Forerunner 35 GPS Watch + Heart Rate Monitor is just the piece of technology she would love to have for alerts, tracking of steps and calories, and synching with other devices via the free Garmin Connect mobile app to keep her activity logs. best hiking gift guide selection? If you're wondering about how to make sense of any the product details, please contact me. I'm happy to help you find exactly the right gift for the type of hiking your favorite hiker enjoys. Let's kick around ways to customize your gift, to get it exactly right. all of this hiking gear?? REI gift cards are highly coveted by hikers. Tuck one into something fun like a kicky pair of socks, and you're golden. I appreciate you because you're a thoughtful gift giver, looking for the best hiking gift guide before you select your gifts. I also appreciate you for giving me a plausible excuse to spend a lot of time gawking at REI gear on your behalf . My hope is that my best hiking gift guide will point you to the perfect (and easy) presents to make your favorite hikers smile, mile after mile. If you're still not sure about what to give, REI makes it simple to find something just right with their top notch website. Tip: Watch for the little blue truck and the message "This item ships for free!" And don't forget: your generosity as a gift giver will pay you back in an annual dividend when you are an REI Co-op member.